Early Sounds and Halfway Ritmo pres. After more than 30 years, Early Sounds and Halfway Ritmo , will release unpublished recordings (1982-1989) from former Tangerine Dream and Iggy Pop’s drummer Klaus Krüger. 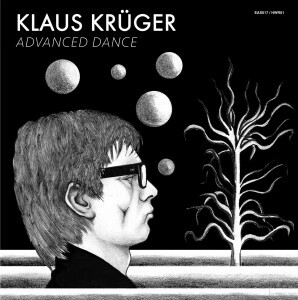 Advanced Dance combines a sweeping mix of Krüger’s handcrafted acoustic drums and distinctive electronic sounds of the late Berlin- School years, creating a unique blend of advanced polyrhythms. Krüger achieved a balance between creativity and classic drum patterns giving birth to an unconventional and avant-garde type of music that could be easily defined as a precursor of techno. His progressive mentality led him to delve further into the tape collage technique and unique ways of triggering his drums. It was a whole new world of music – sustained by his artistic surroundings, which included collaborations as well as friendships with other influential artists such as David Bowie, Martin Kippenberger and Helmut Newton. In the time of German division, the pulsating West Berlin became a melting pot of creativity and international encounters. Advanced Dance is the result of the blazing heat feeding the unstoppable thirst of discovery which characterized that generation, creating tunes that transform the listener’s experience into one blissful moment amidst beautiful confusion.